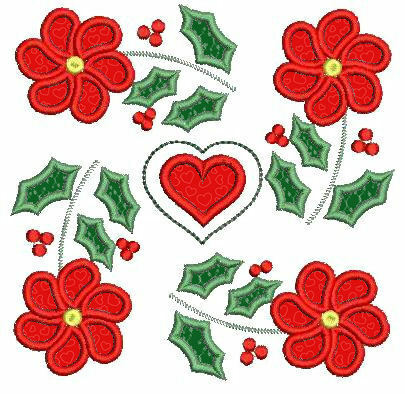 Holly Wreath 2 Applique - 2 Sizes! Create a bit of history with this design, typical of those first used by the women of Baltimore Maryland in the mid-1800's. This colorful design is ready to use on your quilt blocks, decorative pillows, tote bags, placemats, bookcovers, garments (think back of cardigan sweatshirt!) Enjoy! Earn 5 points at checkout OR buy this item for 99 points. Create a bit of history with this design, typical of those first used by the women of Baltimore Maryland in the mid-1800's. This colorful design is ready to use on your quilt blocks, decorative pillows, tote bags, placemats, bookcovers, garments (think back of cardigan sweatshirt!) Enjoy! Baltimore Album Applique Sets - 6" and 8"
Finish Size 5.64" x 5.64"
Finish Size 7.28" x 7.28"
This design is also available in a larger set. Just click on the "Baltimore Album Applique Sets - 6" and 8"" link in the "You might also like" section for more information.